Born and raised in Karachi, Pakistan moved to NY, USA to pursuit higher education in Computer Technologies. 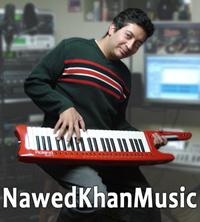 Nawed started playing electronic keyboards and guitars in Pakistan. He has performed with many artists and bands in New York, New Jersey, and Virginia at several occasions including Community Festivals and Pakistan Day Parades. With several Radio, TV, and Media Production credits his skills consists vocals, songwriting, composing, performing, recording, production, promotion and marketing. • Watch it on Facebook. Happy Halal Valentine's Day, a new music video by Nawed Khan on Valentine's Day 2019.